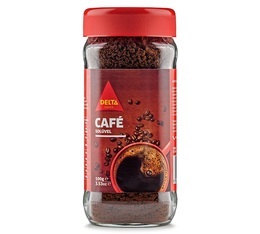 Discover our range of instant coffees from big brands: Illy, Delta Cafés, Lavazza, Maxwell House. Instant coffee is advantageous as it has a long shelf life and is quick to prepare. For all your travels, take your instant coffee everywhere with you. The best way to have a hot coffee quickly and simply, anytime! 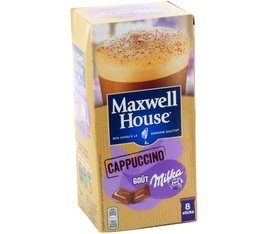 Discover the only Milka chocolate flavoured cappuccino: Maxwell House Cappuccino Milka . One box contains 8 sticks. Discover this Maxwell House Quality Filter Fine Foam Intense instant coffee which lets you make a delicate coffee in an instant! One box contains 100 sticks. Enjoy the famous Black recipe from Illy, Intense, as an instant coffee. 100% Arabica blend. Dark roast. Strong coffee. Enjoy the famous red Illy recipe as an instant coffee in this 95g tin. 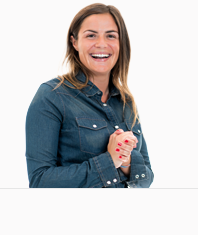 Arabica blend, medium roast, for a balanced coffee with notes of caramel, chocolate and light floral hints. Discover this tasty Maxwell House Cappuccino blend which lets you make a delicious drink in an instant! One box contains 10 sticks. Discover this Maxwell House Quality Filter Decaffeinated instant coffee which lets you make a coffee in an instant! One box contains 25 sticks.